It's a lot less green out there, even here in sunny California. 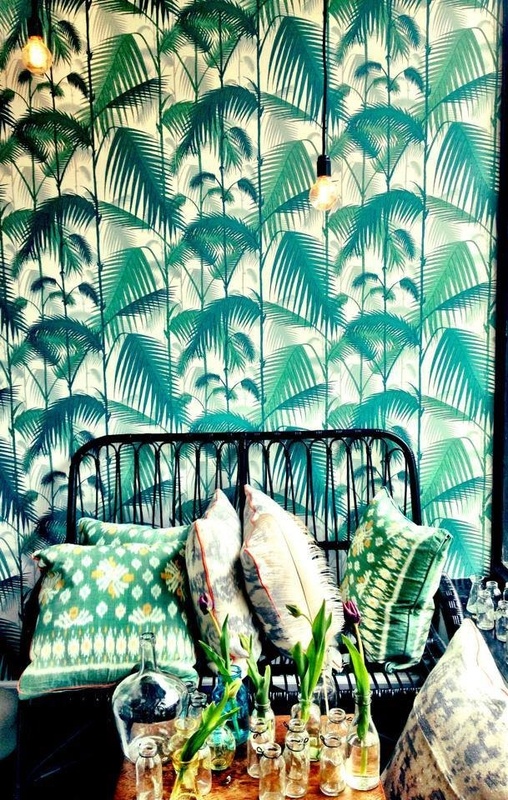 And so I find myself drawn to things that remind me of spring, like these amazing tropical leaf prints. They're wild and fecund and altogether fun. This boldness makes them a bit tricky to work with, though. But fear not: I've got tips for you on how to use them. Read on for some leafy inspiration and education. Fantastic, no? To learn how to use these prints, let's examine the photo above. 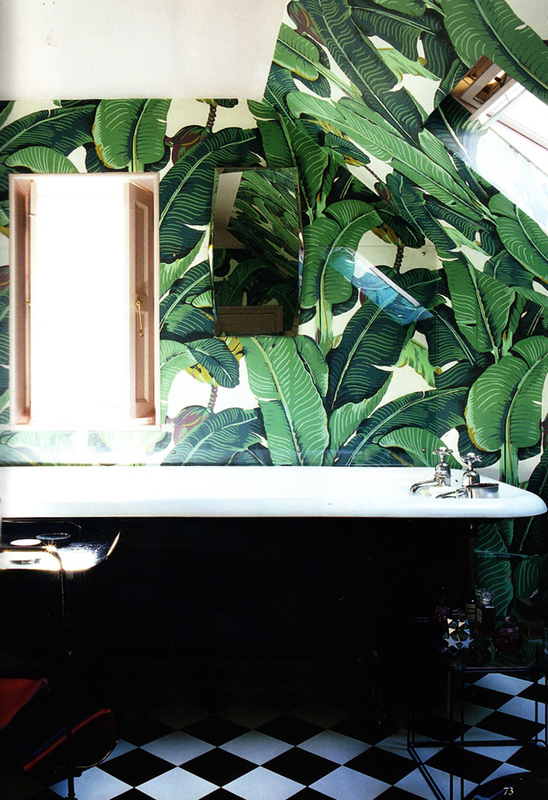 Now, normally I'm a big fan of houseplants, but if you have this much leaf going on with your wallpaper, you can dial the real plant life back. You'll notice that this room doesn't have any real plants, but it still feels plenty fresh and vibrant. It does have a few other natural elements though, which help tie the room to the wallpaper. The driftwood table and rattan lamps qualify. Plus the curtain pattern feels a bit leafy, and the pattern on the bed is is reminiscent of water, quite freeform and natural. The tiles, while geometric, have a soft glaze that also feels earthy. And that duvet looks like linen to me, which is another natural element. All these pieces sing in the same tone as the wallpaper, which helps make the room coherent. You'll notice, however, that the room isn't all natural. The headboard has a shape that is rather old-fashioned and formal, and that burgundy throw pillow and glassware are shiny and refined. It's this juxtaposition that helps make the room feel exciting. You always want this kind of push/pull in your home. It makes for a space that's a lot more interesting than something that's just one note. Finally, though there is a lot of wallpaper here, it does not cover the walls from top to bottom. Instead it runs in a wide band around the room. Not only is this a great cost cutting technique (wallpaper is pricier than paint), it prevents the space from being overwhelmed. And that extra wall space also allows for the incorporation of a beautiful teal blue, which helps tie the walls to the bed and floor. So there you have it: now that you're armed with the knowhow, go forth and embrace something leafy. You'll feel the joys of spring year round.